One of the most important aspects of hosting an effective meeting is being organized and prepared. The best way to do this is to create a meeting agenda. Whether you are hosting your meeting online or in-person, things will run much smoother if you have a plan of action to follow. Below are three tips on how to create and utilize the perfect meeting agenda. First, you should brainstorm what you want to talk about and write down all of your ideas. Next, you will want to organize your ideas in the most coherent way to ensure that the meeting flows well and each topic leads into the next. When creating the agenda, try to limit each line to 2-3 words that convey the topic of the section for easy readability. Another important reason to create an agenda is to get an estimate of how long the meeting will run. In order to be best prepared for the meeting, try to estimate the time it will take to complete each section and denote that next to each topic. A good way to do this is by thinking about what you might say as you plan the presentation. 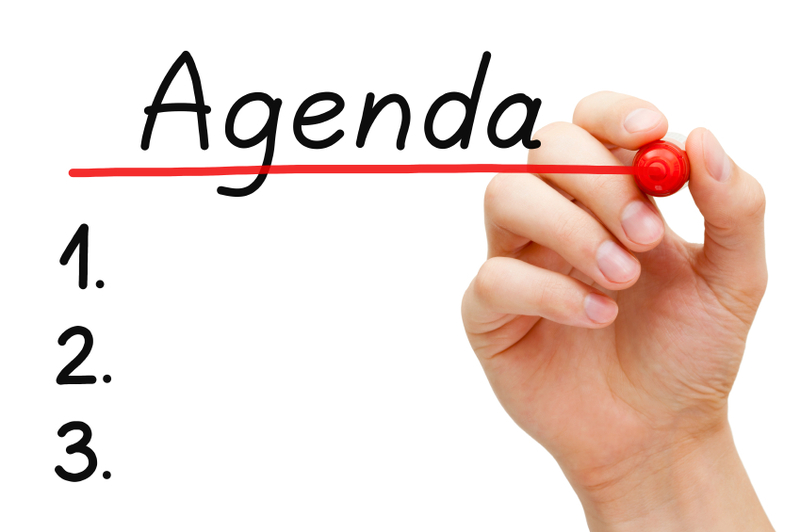 Additionally, having an agenda can be beneficial for you as well as your audience members. If you send out the agenda beforehand, this gives participants the ability to prepare for any parts where they need to contribute. This will also provide audience members with an estimate of how long the meeting will run and the topics that will be discussed in case they have any questions. Agendas are essential when hosting any type of meeting because they benefit not only the speaker, but the audience as well. For an example of a meeting agenda, click below.